SOLAS development is presently sponsored by IGBP, SCOR and CACGP, with support provided by WCRP. Other activities sponsored by these organizations provide opportunities to develop the direct linkages of SOLAS with IGAC and the new Ocean Project (currently being developed by the IGBP/SCOR Ocean Future Planning Committee), GLOBEC, LOICZ, PAGES, GAIM and CLIVAR. The activities of SOLAS will be well coordinated and, wherever appropriate, integrated with the activities of these other projects. The Carbon Joint Project (WCRP/IHDP/IGBP/DIVERSITAS) will synthesize the carbon research within SOLAS and other parts of IGBP, IHDP, WCRP, and DIVERSITAS to answer questions on global sustainability related to carbon. For remote sensing and observing systems, SOLAS will work closely with CEOS, GOOS and GCOS. SOLAS will collaborate with LOICZ and PAGES for input to its studies in coastal zones and the use of palaeoceanographic records, respectively. Societal impacts of SOLAS will be dealt with in collaboration with IHDP. 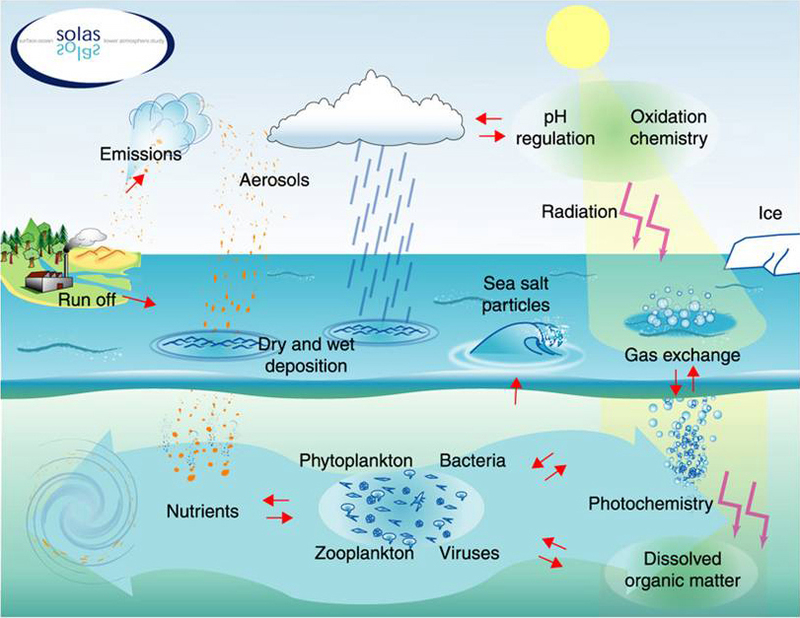 --- to achive quantitative understanding of the key biogeochemical-physical interactions and feedbacks between the ocean and the atmosphere, and how this coupled system affects and is affected by climate and environmental change.